Tremendously rare German vehicle joins line-up of nearly 200 motorcycles. For immediate release. 1 November 2010 – San Francisco – Bonhams is very proud to make the uncommon announcement that a complete 1895 Hildebrand & Wolfmüller has been consigned and will be offered at the firm’s first annual Las Vegas Motorcycle Auction in January. Coming from a private American collection where it has resided for approximately half a century, the 115-year old motorbike has been lightly and sympathetically restored some decades ago and is wonderfully patinated. In addition to its excellent condition, this pioneering vehicle is of the utmost historical significance because it was the first powered two-wheeler to enter series production and is the first vehicle to which the name “motorcycle” (motorrad in German) was ever applied. This extraordinary news follows the record-breaking sale of another Hildebrand & Wolfmüller offered by Bonhams earlier this year in Britain. That 1894 relic caused considerable excitement across the world resulting in a packed salesroom and an above-estimate selling price of £86,200. The model being offered for Las Vegas next January is substantially superior and carries a conservative estimate of $130,000-$150,000. History: The factory for the Hildebrand & Wolfmüller motorcycles started out in Munich, Germany in 1894. 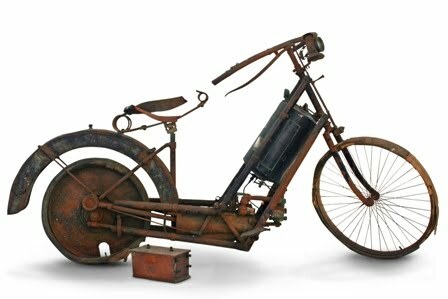 The name is derived from the engineers involved in making, as to what is officially, the world’s first motorcycle. They were the German brothers, Henry and Wilhelm Hilderbrand and a third German gentleman, Alois Wolfmüller who were also assisted by Wolfmüller’s mechanic, Hans Geisenhof. Actually there were 2 wheelers before, but the term mottorad (German for motorcycles) was first used for this brand. Plus the fact that the motorcycle is the first powered 2 wheeler which had a series production almost gives it an ‘Adam’esque image for motorcycles. Thereby the importance and significance of this brand to automobile history is needless to mention. The motorcycle was powered by a huge 1.5 liter water-cooled, four-stroke, twin-cylinder engine. It had a maximum power output of 2.5bhp @ 240rpm which made the large machine travel at speeds of up to 65kmph (30mph) at a time when the century was mentioned as 18th and now we are in the 21st. Think about it. The year was 1894. The machine used direct drive instead of a chain or shaft, with connecting rods from the cylinders acting directly on the rear wheel via eccentrics, just think of an chuk-chuk train that you see in black and white movies with smoke coming out from the engine. Of course, as one would expect, the whole world greeted it with enthusiasm and the brand also set up a second unit in France and marketed there as ‘La Petrolette'. But the bike had too many shortcomings, even if it was a first among firsts. Within 3 years, after almost all customers complained and the firm collapsed. Of course, now its value is unparalleled. There is somewhere about 800 to 2,000 of these motorcycles produced. Yes, the estimate has a high variance, but both figures are debatable and survivors… well, after more than a century, how many do you expect? Bonhams has, in fact sold one this year (as mentioned in the quoted text above) in UK for £86,200 while this more robust and done up model is expected to fetch between $130,000 to $150,000. The model that was sold in January was with a U.S family since the last 80 years or more.